Let’s discuss the possibility of the wall being a joint structure between Mexico and the United States. The structure could essentially house local and international business offices, university classrooms, local retail, and other areas of commerce. Why should the border wall only exist as a crossing point? Borders separate, so if we redefine it to be a shining example of international trade and diplomacy, then we could sell it better to opponents and spawn another remarkable structure for our posterity. Build bridges, not walls: the war cry of some on the far left highlights only one aspect of the structure the far right wants so badly, generally speaking of course. To make compromise great again, we should accept the wall and argue what goes into and around it. Idealism would posit that immigrants to the United States would be interested in learning some English, a brief history of the United States of America, and various other classes that would generate revenue on local and federal levels. On the flip side, many of our own citizens may be interested in attending courses about Mexican History and the Mexican dialect of Spanish. With corporate interest, we would draw in security firms to help with defending the border, although there are complex political policies involved with international affairs and companies. 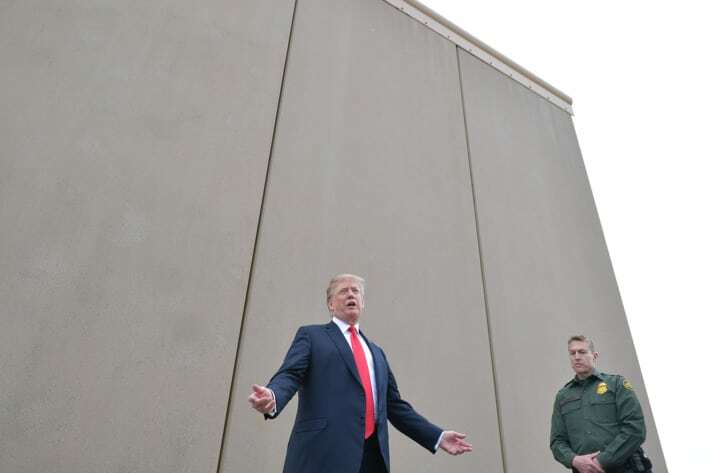 One solution would be to build the wall as equally as possible along the border to allow for half of the structure to follow Mexican policies and the other half to follow the United States’ policies. In regards to these cities near the border, building a wall would require compliance and agreement from these areas to accommodate any infrastructure which would not only preside in but strongly effect through proximity alone. These more rural areas normally harbor more conservative views, although that doesn’t completely point to fully supporting the President or the Border Wall. The nearby cities will have to give up land for the actual infrastructure and for the area in between the US wall and the probable Mexican wall, creating a no man’s land between. This will forgo the Rio Grande and all of the wildlife there. Tourism on both sides will plummet along with the direct revenue of farmers with land loss and businesses with the overall revenue loss throughout the city. Iossifova states that, even within a city, borders separate cultures and cause strife for reasons including income imbalance, the emergence of social enclaves, and the rise of general mistrust between the de jure social classes. Applying these sentiments to a larger scale may be haphazard, but the parallels are apparent in the cities which lie on the US-Mexican border. The international crisis extends beyond the US and Mexico. Both nations have already been working together as Mexico evolves into becoming an immigration destination. The multiple crises in South American countries – especially Venezuela – have left the region with mounting humanitarian issues regarding migration and international relations. Although the United Nations has discussed sanctions against Venezuela, allies China and Russia don’t see a truly international issue as of yet. The US has sent $46 million in aid to the region, but the superpower’s credibility on these issues has drastically fallen in the world stage due to recent strong-armed policies regarding its own border. Starting this year, the US has discussed giving Mexico some $5.8 billion in creating infrastructure along Mexico’s southern border to help with processing immigrants and to ease the flow of caravans into both countries. Although unclear on the timeline, the notion that the humanitarian crisis which affects both parties can be solved with other options other than a wall is contrary to what the President has currently been presenting. With the longest government shutdown in history just behind us, it will take more than just a wall to reconstruct credibility and negotiability for the US in these and other talks regarding immigration and trade. If the US-Mexico border wall truly begets construction, then let it be an American-Mexican joint venture to exemplify to the world how to solve a humanitarian crisis involving immigration. The Mexican side could offer more comfortable accommodations for those seeking asylum in either country whereas the US side can focus on processing those wishing to become citizens or permanent residents. I write this to push for further discussion, meaning the government should be reopened now in order to give this crisis its due contemplation and to allow for bipartisan support outside of the entrenched idea that we are only red and blue.